OVER THE YEARS, various theories have arisen concerning John Calvin’s political views. Some have viewed him as a virtual dictator, “the pope of Geneva.” Others have felt he was a master of dissimulation who always got his own dictatorial views across by subtle means. Yet others have suggested that he was one of the founders of modern democracy. Which view, if any, is correct? To understand Calvin’s views on political government, one must understand the political context of his day. Democratic forms of government were on the decline. Even those countries which had tended towards more democratic forms of government (e.g., the Estates General in France, Parliament in England and Scotland, and the Imperial Diet in the Holy Roman Empire) were reversing that trend. Democratic institutions still existed, but any power which they possessed had been largely taken away by the absolute monarchs. These rulers sought to imitate and practice the ideas set forth in Niccolo Machiavelli’s (1469–1527) famous book, The Prince. Machiavelli advised princes on how to achieve absolute power. The claims of the worldly princes were challenged by the popes, who viewed themselves as the spiritual rulers of the world. As the representatives of Christ, the popes asserted their right, not only to persecute those who disagreed with the Roman Catholic Church, but even to depose monarchs who refused to obey their orders. (Pius V asserted this right when he decreed that Elizabeth be deposed from the throne of England.) Democracy had few supporters in places of power in the early sixteenth century. One must also take into account Calvin’s own background and training. The son of a Picard lawyer, he was at first destined for the priesthood. But his father, after a conflict with the local bishop, ordered Calvin to leave Paris, where he had been studying, and go to Orleans to study law. It was not long before he heard that one of the innovative humanist lawyers, Andre Alciat from Italy, was teaching at Bourges. While Calvin apparently did not like him personally, he learned much from him, particularly the new ways of studying and analyzing historical legal sources. This fit well with the training which he had already received in Paris, so that Calvin’s training prepared him to be both a humanist scholar and a lawyer. Probably even more important was the fact that, during his studies at Bourges, he seems to have accepted the teachings of the new religious movement which we know as the Reformation. By this time, Luther’s teachings had spread widely, even in France. There was also the reforming activity of Ulrich Zwingli in Zurich and the Anabaptists in Switzerland and Germany. Calvin undoubtedly had some knowledge of their beliefs early in his Christian experience. His acquaintance with their views certainly increased as the years passed. All these various influences entered into Calvin’s political thinking, whether he agreed with them or not. Luther thought of the ruler as being supreme over the church in all such worldly matters as property and even organization, but he insisted that this authority stopped at the foot of the pulpit. Zwingli, on the other hand, allowed the civil ruler nearly total control over the church. In contrast to all, the Anabaptists would have nothing to do with the civil authorities. The responsibilities of the civil government, the Anabaptist said, were limited to non-Christians. True Christians did not require civil supervision, since they already obeyed God’s law. By the time the first edition of theInstitutes of the Christian Religion appeared in 1536, Calvin had considerable knowledge of these varying views, as well as those of classical writers such as Seneca and Cicero. He also probably knew the works of Jean de Terre Rouge (c. 1418) and Claude de Seyssel (c. 1519), who had written works stressing the limitations of royal absolutism. Yet, with all these various influences upon him and the social context of his own day, there was one ultimate authority to which he adhered above all others: the Bible, the Word of God. From the time of his conversion, this was basic to Calvin’s thinking. The oracles of God possessed ultimate authority over man, because God is sovereign over all creation. This theme of the sovereignty of God appears repeatedly in Calvin’s whole system of thought. True, man might not understand everything in the Scriptures or in God’s purpose, for “the secret things belong to God” (Deut. 29:29), but what God has revealed must form the basis and the structure of the Christian’s thinking. To Calvin, this meant that there was very clearly a Christian—biblical world—and—life view which encompassed all phases of life—not just religion, but science, economics, and politics. In treating the subject of politics, he was prepared to look to the classical writers and the humanists of his own day, since he believed that even the non-Christian had implanted within him, by the grace of God, a sense of justice and equity. However, the ultimate authority for his political ideology was the Bible. There God had declared what the political state was to be like and how it was to function. According to Calvin, the church has a role to play with regard to the state. 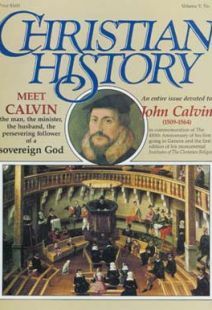 The church is responsible, Calvin believed, to set forth the biblical teaching concerning the state and its function. Yet, and this is basic to Calvin’s thought, the church is not to rule the state. Calvin believed in a theocracy, not an ecclesiocracy. Both the rulers of the church and the civil magistrates are directly responsible to God for their actions, but they do not rule over each other. The church may admonish the magistrate as to what God’s law says, but cannot determine how that law is to be applied in matters of civil jurisdiction. The magistrate may advise the church concerning matters relating to civil affairs, but cannot force the church to conform to civil rules in its teachings, worship, or government. In this, Calvin laid down very clearly the principle of the separation of the functions of church and state. They are related and mutually supportive, but also independent of each other. This means, if the state attempts to interfere in the operation of the church or seeks to restrict its spiritual work, the church has the right and duty to disobey, although it will have to suffer the consequences of such disobedience. At the same time, Calvin believed that the church’s form of government was to be fundamentally democratic. In this way it served as a pattern for the state to imitate. He did not believe that ministers and other church officials should be imposed on the church by the civil government or by a small group of wealthy or aristocratic individuals. Instead, he believed that ministers, elders, and deacons should be appointed by the people of the church as a whole. Those who wanted to become ministers were first examined by the consistory, made up of ministers and elders of the churches, as to their morals and knowledge of the biblical teachings and their ability to serve as pastors. When approved, they were then presented to the city council, who would be responsible for their financial support. Finally, they were presented to the people, who had the right either to accept or reject them. The congregation as a whole thus had the final say as to who would be the minister. These procedures, as set forth in the Ecclesiastical Ordinances, undoubtedly influenced the civil government in Geneva. Calvin held the magistrate in high honor. In fact, he insisted that being a magistrate was the most important calling anyone could receive. The state was created by God to maintain peace and equity in a sinful world. The state, however, does not have the freedom to do as it pleases, for it is under the rule of God’s law. Divine law is the basis of the church’s administration, but this law is also the foundation of the state. This is true even of a state which has no Christian instruction. Even the unregenerate have implanted in their hearts and minds a knowledge of justice and equity by which society is governed. To Calvin, this natural law is the foundation for all political government. This immediately raises the question of who is to govern. To Calvin, a ruler, whether an individual or a body made up of a number of individuals, is a necessity. Without someone to guide and direct the enacting and enforcing of laws, a society simply falls into anarchy. However, that ruler is ultimately appointed in and by the providence of God. Calvin did not favor the idea of succession by right of birth. Rather, he believed free election was the best method of establishing a ruler. He did not, however, declare that all non-elected rulers were illegitimate. But he did hold that election by the citizenry was the means whereby God would choose the individuals most suitable for the exalted position of magistrate. What then is the proper relation of the magistrate to the law? Is the ruler above or under the law? Calvin held that the ruler is under divine law in his relation to the sovereign God. But in relation to the citizens, his subjects, the magistrate is the personification of law. This does not, however, free the ruler to rule as he pleases. The laws which are enacted must be equitable and enforced equitably. This means the ruler is to rule for God and for the people. The ruler, whether an individual or a parliament, must seek to benefit, protect, and sustain the people. The establishment of poor relief, hospitals, and similar social agencies in Geneva had its source in this concept. At the same time, the people are to obey the ruler, not merely because of social benefits, but because they are obeying the authority which God has established over them. Only if they are commanded to do that which is contrary to God’s revealed will are they obliged to disobey the law. At the base of this concept of the relation of ruler and ruled was Calvin’s covenant idea. He held that there was in reality a covenant between the people and the ruler (even if the latter succeeded to the position of ruler by the right of birth). Therefore, there was mutual responsibility. In a truly Christian government, there is also a covenant between God and his subjects. This, of course, was based upon the Old Testament concept of government in which Israel was the covenant people under such rulers as David and Solomon. To Calvin, this covenant relation in the New Testament dispensation was no longer limited to Israel, but should characterize all states claiming to be Christian. Here we come upon one of the ideas which seems to have undergone development in Calvin’s thought. Many of the rulers of his day were tyrannically exercising their authority over their people. This was particularly noticeable in the matter of religion. Persecution of Protestants was usually instigated by the clergy, but carried out by the civil authorities. In his Epistle Dedicatory to the first edition of the Institutes, Calvin called upon Francis I of France to stop attacks on and executions of Protestants. As a result of such royal oppression, the Genevan reformer increasingly felt that hereditary monarchy could only lead to tyranny. So he opposed it. Yet, bad as tyranny might be, Calvin considered it better than anarchy, where total lack of order could only lead to the collapse of society. Christians, therefore, must submit to tyrants and obey them, for they were sent by God as punishment for sins or as a providential means of training. Only when the tyrants commanded that which was contrary to God’s revealed will could Christians disobey. What about the possibility of rebellion? At first, Calvin was absolutely opposed to any such action. But it seems that he gradually became more reconciled to the idea of anti-tyrannical action. However, he felt such action could never be taken by an ordinary citizen. Only those who hold public office have the right to resist the ruler. This view was expressed in his first edition of the Institutes and repeated in all the later editions. However, in some of his commentaries, he seems to gave gone further, even accepting the idea of the right of the inferior magistrates to remove a tyrannical, persecuting monarch. In taking this position, he was clearly laying the groundwork for possible revolutionary action, not only by Protestants who were under persecution, but by all those who were oppressed by a tyrannical, dictatorial government. Thus, in summary, as we look at Calvin’s political ideas, we see the enunciation of the basis for democratic government. In his thinking, all society is subject to the sovereign God and therefore to his law, whether expressed in the Old Testament and set forth by the church or in the sense of justice and equity given to all men. To achieve this end, God establishes states ruled by magistrates who have the duty of enforcing the divine laws in order to maintain justice and equity. Calvin believed, however, that magistrates who are elected are more likely to rule justly than those who take control by inheritance or force. Furthermore, the tyrannical heredity ruler, as well as the one who illegally seized power, could be resisted even to the point of removal by the duly constituted magistrates of the realm. Here was a political philosophy which was to have a major impact on the western world over the next few centuries. To get a glimpse of Calvin’s influence on political thinking in his own day, we must turn first of all to the city of Geneva, in which he lived. He undoubtedly wielded considerable influence on the codification of Geneva’s laws, as he was the secretary of the committee appointed to put the laws into a proper form. During the years following 1542, when the laws were codified, he also exerted no little personal influence on the governing bodies of the city. From Geneva, his influence spread far and wide. His writings, including his biblical commentaries, pamphlets, and above all the various editions of his Institutes, were read and studied widely, even by those who did not agree with him. Then, too, Geneva offered shelter to a great number of religious refugees from many countries: France, England, Scotland, the Netherlands, Germany, Hungary, Italy, Spain. Many of these refugees eventually returned to their own countries, carrying with them Calvin’s theological and political ideas. Once the university was established in 1559 in Geneva, others came to study there, usually returning home having drunk at the Calvinistic fountain. The outcome of this was that Calvin’s political ideas became the standard view among those who accepted his theological teachings. It is not surprising, therefore, to find his French followers setting forth a political concept which would undermine the absolutism of the French monarchy. Francois Hotman, Hubert Languet, and Philip du Plessis-Mornay propagated his views vigorously and effectively. In Holland, Calvin’s teaching seems to have been at the root of the Dutch resistance to Spanish dominion, which resulted in the establishment of an independent kingdom of the Netherlands. And, if one looks across the English Channel, one finds Calvin’s influence equally strong. While still refugees in Geneva, John Ponet and Christopher Goodman produced works setting forth radical democratic ideas which fit with Calvin’s political teachings. Perhaps the most thoroughgoing Calvinist, who took the teacher’s ideas to their logical conclusions, was the Scot, John Knox. Knox set forth his views in a number of pamphlets, the best known being The First Blast of the Trumpet against the Monstrous Regiment of Women, published in Geneva in 1557. Calvin disapproved of it, although it was approved by others. Knox’s views were adopted by George Buchanan, another Scot, who was the tutor of James VI (Later James I) of England. Out of Calvin’s influence on the British Isles rose the English Puritans and the Scottish Convenanters of the following century. Dr. W. Stanford Reid is Emeritus Professor University of Guelph in Canada. A tragic event during Calvin’s tenure in Geneva. Resolved to remain obscure, Calvin could not stand his ground with William Farel. Full text of a letter Calvin sent to Martin Luther. Selections From Confession of Faith which all the citizens and inhabitants of Geneva and the subjects of the country must promise to keep and hold.